"Pretty much just corridors leading to small rooms"
This map is a pretty down to earth map. 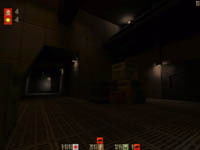 Pretty much just corridors leading to small rooms and of course the other teams spawn areas. Not much for creativity. Just the run of the mill corridor shooter. You may say that after seeing the maps that RXN made, my standards have been significantly raised. Keep in mind I did not go thru DETAILED so just saying that I would not like to be flamed for anything I mess up on since I am doing this review late at night. Comment: Kept with the Gloom feel and maintained stability throughout the map. Comment: The low thrills layout makes room for quick action. This review has been read 1724 times. The Gloom Map Depository is copyright Team GMD. Quake2 is a registered trademark of Id Software. Gloom is copyright Team Reaction. The review script is copyright R1CH.